Sleeping Baby Boy with toy dog and puppy. When you bring a new baby home, your dog will face an overwhelming change to her routine, and will get less of your time and attention. Your GSD has been the “only child” for a long time. 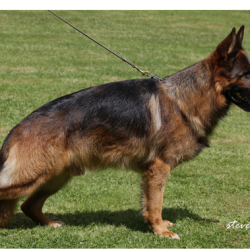 As a Premier Ontario Breeder of purebred German Shepherd puppies and trainer of adults GSDs, Von Issam Haus recommends that you prepare your dog in the months before the baby comes. The most important tasks are teaching your dog the skills she’ll need to interact safely with the baby and helping her adjust to the changes ahead. Luckily babies start out not doing much and then slowly become more active and mobile. The slow pace of these changes will help your dog get used to your newest family member gradually, but it is guaranteed that your baby will eventually be poking, grabbing, crawling and unpredictable. Please remember that dogs that are elderly, have chronic pain or are deaf or blind may not be able to interact safely with a young child. 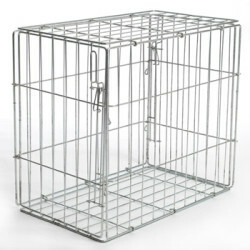 If your dog is elderly or ill you may need to separate your dog and your child to avoid risky situations. If you feel that you it is not realistic to always keep your dog separated from your child at all times it may be advisable to have the dog live in the home of someone with no children. Of course your child’s safety is your first priority and if you are not 100% confident about the safety of your baby with your dog, then you may have to find your dog another home to protect the well-being of your child. As long as four months before the baby arrives you should begin to gradually introduce your dog to the new experiences, sights, sounds and smells she’ll encounter when you bring your baby home, and associate these new things with rewards. This will help your dog learn to love life with the baby. Many dogs experience anxiety when their lifestyles are drastically altered. Minimize your dog’s stress by gradually getting her used to these changes in advance. Prepare your dog for a less consistent daily schedule by varying the time you feed or walk your dog. Make New Rules Now: If your dog is used to sleeping in bed with you and you want that to change with the baby’s arrival, provide a comfortable dog bed. Car. Stay, wait at doors and settle: commands can help your dog learn to control her impulses, and you can teach your dog to lie down and stay whenever you sit in your nursing chair. Leave it and drop it: can help you teach your dog to leave the baby’s things alone. Greet people politely: prevent dog from jumping which can be dangerous when you’re holding the baby. Play fetch: Teach your dog to play fetch with a toy can prepare her for safe, fun interaction with your child. Rough Touching: to prepare your dog for the grabbing, poking, pushing and pulling that she can expect from the baby you need to teach her that good things happen when she gets poked and prodded. To prepare your dog for the way your baby will touch her, teach her that good things happen when her various parts get poked and prodded using treats to reward your dog for tolerating uncomfortable sensations. Poke your dog gently in the side, and then immediately give her a treat. Repeat five times in a row, at least four times a day until your looks up at you for a treat every time she is poked. You can then vary the touching and add gentle fur, ear or tail pulling and gradually increase the pressure of pulling. Guarding Prevention: Dogs get upset when a baby gets too close to their food, bones or toys and may react aggressively to “guard” their possessions. Before your baby starts to crawl you need to teach your dog that good things happen when someone approaches her stuff. When your dog is eating her dinner, toss something delicious into her bowl, like a small piece of cheese. Repeat for a week and then start reaching into your dog’s bowl to place the treat on top of her dog food. After a week of this then start reaching down to feed your dog the treat from your hand, right next to the bowl. After another week, start patting her back before feeding her the treat. The next week, reach into your dog’s bowl with your empty hand and touch her kibble with your fingers before feeding her the treat. The last step is to reach down and take away the bowl, feed her a treat, put a treat into her bowl and return it to her. After a series of repetitions your dog should start to back away from her bowl when she sees you coming. 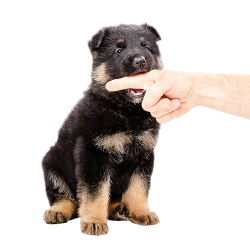 You can do the same type of training with bone chewing and playing with toys. Send everyone else into the house first so your dog can greet them and uses up some energy. Then leash her and have treats ready to use during the first few moments with the baby. Speak to your dog in a cheerful voice and have a helper distract her with treats and order her to sit and down, commands by using treats to reward obedience. Praise your dog for calm interest in the baby and avoid scolding. Give your GSD lots of attention when the baby is present. She will learn to love it when the baby is awake and active if she associates the baby with positive things such as food and exercise. Include your dog in baby-related activities such as sitting nearby when you’re changing a diaper while talking to both. When you feed your baby dinner, feed your dog her meal and when you take the baby out in the stroller bring your dog along. Never force your dog to interact with your baby. Let her approach him on her own. 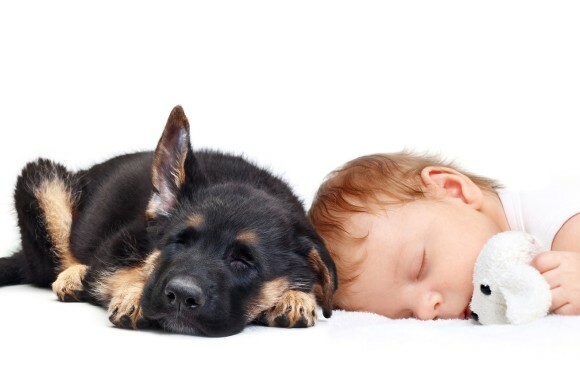 A baby may not recognize dog warning signs (growling and barking) If your dog shows aggressive behavior around your baby keep the dog away from him and immediately contact an animal behavior expert for help because there is a serious risk for a possible biting incident. 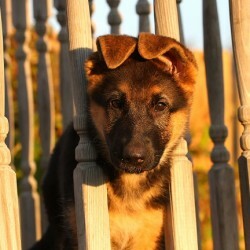 Create Safe Zones for your GSD: Install safety gates to designate some rooms as off-limits to your dog. She will benefit from the creation of her own safe areas in the rooms where you spend most of your time. Try to find an elevated spot where your dog can get out of your toddler’s reach such as a blanket on your sofa. When you’ve decided where the safe zones will be, help her to use them by standing next to the area and saying “Go to your spot”, showing a treat and then tossing it onto the spot. When your dog hops goes to the spot, praise her in a cheerful voice and repeat the exercise about 10 times. Then say your cue, “Go to your spot”, point to the spot and encourage her to jump up. Praise her and give her a treat. Slowly increase your distance from the spot until you can stand across the room and have the dog go to her safe zone when you say the cue. Occasionally give her a bone or Kong to enjoy. It is your responsibility as both a parent and dog owner to teach your child (in ways appropriate to their stage of development) to respect your dog’s body, safe zones and belongings. You need to ensure that you or another responsible adult is always there to supervise interactions between your dog and your child to model and guide appropriate communicate and play. 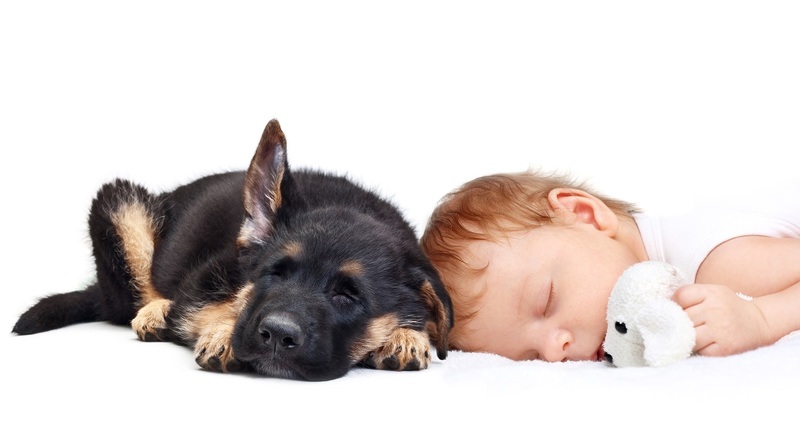 Never leave your child alone with the dog since sudden behavior or noise from the baby could unexpectedly irritate her. Watch for pacing or unusual eye contact that may indicate your dog isn’t comfortable with the baby. You can show your child gentle, enjoyable petting and teach structured games like fetch and tug-of war. Teach your child not to bother the dog, yank her tail, etc. and give lessons on mutual respect.